Having worked in the Maldives for the last 4 years, it has been impossible to avoid the growing apprehension about rising sea levels. According to Presidential-candidate-turned-environmental-warrior Al Gore we are in a ‘genuine planetary emergency’. With sea levels supposedly rising 0.9cm a year, it is hard for a diver like me to notice much of a change in the relatively short time I’ve been working in the Maldives. I do however, on a daily basis, witness man”s struggle with nature. The luxury resorts wage a perpetual war with sand pumps to replace their beaches which are eroded by the tides and currents. While our ingenuity and tenacity may stave off the rising tide in the short term there is unlikely to be a local long term solution for the 1,192 islands of the Maldives. This is a bigger battle which must rather be fought in the halls of policy makers around the world. But is there a clear and present danger? Peter Doran says, “The debate on the authenticity of global warming and the role played by human activity is largely nonexistent among those who understand the nuances and scientific basis of long-term climate processes,”. This apparently does not include petroleum geologists, with only 47% of a recent survey believing that human activity played a role in climate change… perhaps unsurprising. 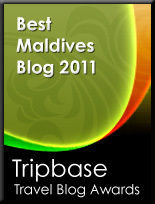 If the Maldives is to go under, they are at least aware of the problem and have plans in motion to . Although daunting, it is a fairly painless experience compared to the sudden trauma of a tsunami. I have no doubt the Maldives will survive in someway, perhaps with a reduced population living on islands adapted with sea walls to protect them. A hub for an armada of liveaboards and floating eco-resorts that can navigate through the sunken islands and enjoy the incredible marine life that will inevitably remain. forthcoming book prove to be prophetic? Will the Maldives become a true “Underwater Kingdom” in our lifetime? This article has been viewed 2,957 times. It just seems beyond crazy to me that people are still debating the existence and cause of climate change. We should be trying to reduce our carbon emissions and live more sustainably and in harmony with our environment regardless! Nice article. I’m not sure how much real danger there is although it’s good to be prepared I guess. I agree that we should try and live in harmony with our planet and reduce our impact on it. There are still plenty of people who want to debate the contribution man has made to climate change though, rather than debate climate change itself. There is a growing list of qualified scientists asking for this. Have to agree with Roger on this one. Even if there is still debate over global warming, there are still obvious human impacts on our environment. Smog in cities, bioaccumulation in rivers, destroying rainforests for new farming land. Anyway that we can reduce our impact on the planet is never a bad thing!